On August 25, 2018, the second Brigada Ang Galing (“Brigada”) was conducted in Manila North Cemetery. Brigada is a support program for Ang Galing, a weekly tutorial program for the children of Manila North Cemetery. In Brigada, various stakeholders and volunteers are invited to help create new and fun learning materials for the Ang Galing children to practice reading and writing in Filipino. 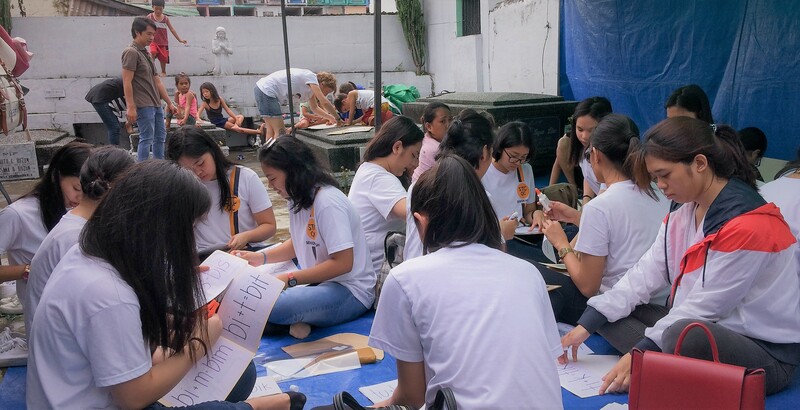 This year, Brigada was attended by the parents and neighbors of Ang Galing learners, full-time volunteers of ATD Fourth World, volunteer tutors, and around 20 students from OrFun, an organization in St. Theresa’s College. Graduates of the Ang Galing program, as well as a few existing students of Ang Galing also came to help. Weather was sunny until mid-morning when strong rain started to fall. While a canopy was available, there were more participants this year than could fit inside the canopy. There was also some minor flooding in the venue. With the support of the community, these problems were solved and the program was able to continue. Additional tarps and plastic straw rope were found and used to form a makeshift canopy. Walis Tingting (reed brooms) were borrowed from neighbors to push back flooding water. Small tables and chairs were borrowed to keep the materials from getting damaged from the wet mats. With the cooperation of everyone, the group was able to make many new learning materials for the children – reading fishes, flashcards for three-letter syllables, and other reading exercises.